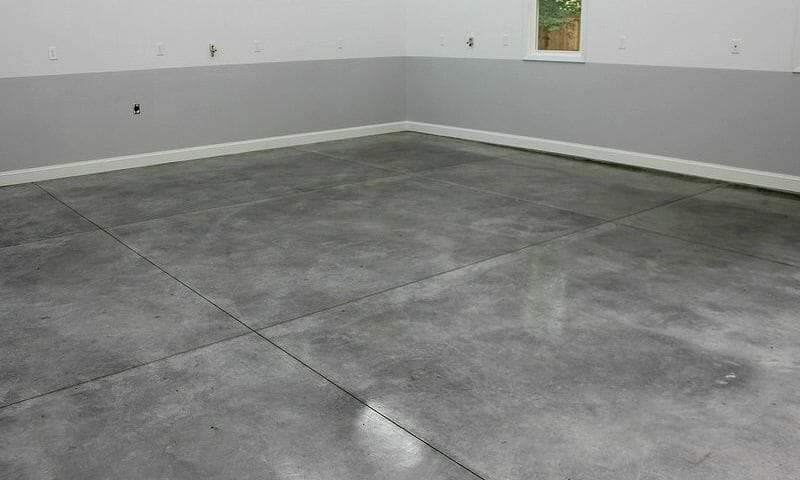 We have to admit that a polished concrete garage floor can look fantastic. The natural concrete look with a mirror finish is stunning. As an option, add a concrete stain and a few well-placed decorative saw cuts during the polishing process and you can have a custom look and design that will be the envy of your friends and neighbors. This begs the question though; is polished concrete truly a practical application for a garage floor? You may have seen some of the features and benefits that are listed for polished concrete. Some of these benefits include stain resistance, good light reflectivity due to the glossy finish, easy cleaning and maintenance, a surface that is not easily damaged, and long life since the flooring never needs to be replaced. It typically is less slippery when wet than some other garage flooring options as well. 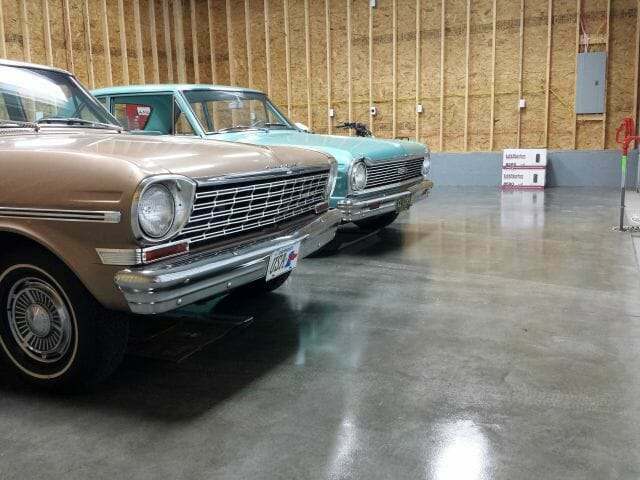 If you didn’t know any better, polished concrete seems like the best garage flooring option that you could choose. But is it? Most, if not all of the stated features and benefits for polished concrete, are true. However, you may be surprised to learn that a polished concrete garage floor is not as practical as you may think for many garage environments, though they can work well for some. 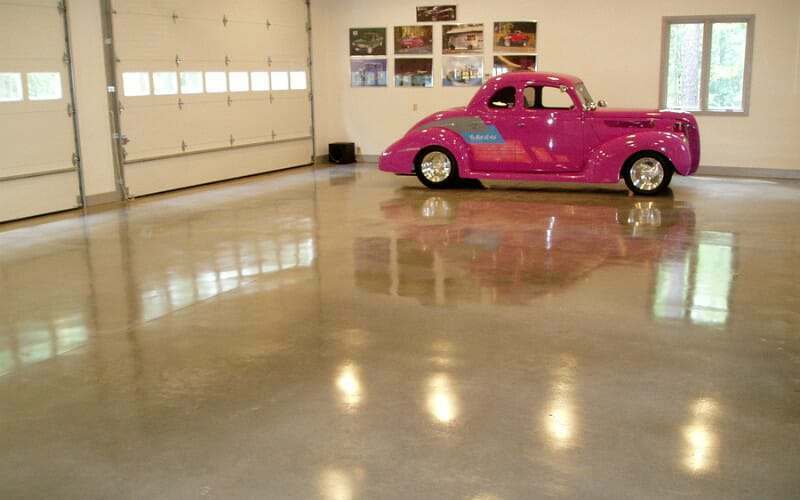 So, do we recommend polished concrete for your garage floor? Well, in order to better understand why it may or may not be good for your garage, it’s first important to learn the process of how concrete is polished. Polishing concrete is not as simple as running a large buffing machine on bare concrete to shine it up. It is actually a series of many steps that includes grinding, honing, and then polishing. The process starts with a large planetary grinding machine using metal bonded diamond grit discs. It can start as low as a 16 grit disc and then work up in multiple passes to a 150 grit disc, though you can go higher in some cases. 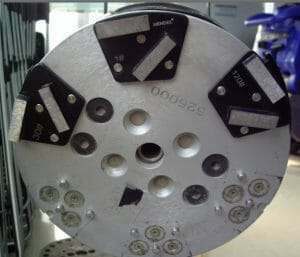 Each successive disc removes the scratches and grooves created by the previous diamond disc. Which grit disc that you start with is determined by how much aggregate you want exposed (if any) and what kind of shape the concrete is in to begin with. In other words, are there defects to be removed, waves in the concrete that need leveling, old coatings present, and etc. The grinding opens up the pores of the concrete. Once the last grinding pass has been made, the concrete is treated with a liquid densifier to harden the surface in order to aid the polishing process. A densifier may be added more than once depending on how hard or soft the concrete was to begin with. Densifiers also aid in preventing water penetration and they help to resist staining of the concrete. At this point the honing process begins with the use of resin bonded diamond discs. Honing will give the concrete a low satin sheen that begins to shine up with each successive step. You actually step down a grit when you start this process. For example, if the grinding finished with a 150 grit metal bonded diamond disc, you would begin the honing process with a 100 grit resin bonded disc. Many times the first disc used in the honing process is a transitional diamond disc. Honing then continues with 200,400, and then 800 grit discs. It is during the honing process that a concrete stain can be introduced if so desired. Red stained polished concrete garage floor by Phase II, Inc. Note the carpet drip mats. It is after the honing process where the true polishing of the concrete begins. It generally finishes with 1500 or 3000 grit diamond impregnated pads. With polishing, the higher the grit you finish with, the higher the gloss of the floor. It is after the polishing process that an optional stain guard can be applied to the surface of the concrete. The stain guard is a penetrating sealer with an ultra-thin topical coating that helps to protect the concrete from liquid chemicals, solvents, and staining. When you decide to polish the concrete of your garage floor, you first need to decide on the aggregate exposure that you would like to see at the surface and then the level of gloss or shine that you require. The aggregate exposure is measured as class A, B, C, or D. Gloss is measured as level 1, 2, 3, and 4. Class A is a cream finish which has little to no aggregate exposed. Class B is a fine aggregate of 1/16” – also referred to as a salt and pepper finish. Class C is a medium aggregate exposure of 1/8”. Class D is a large aggregate exposure of 1/4”. Level 1 is below a 100 grit with a flat appearance and no sheen. Level 2 is 100 – 400 grit with a satin or matte appearance and low to medium sheen. Level 3 is 800 grit and higher with a semi polished appearance and medium to high sheen. Level 4 is 1500 grit and higher with a highly polished look and sheen. It’s not uncommon to have a mirror appearance that may even look as though it is wet. The video below is an excellent example of how these aggregate classes and gloss levels are applicable. Now that you know how concrete is polished and protected, we will discuss who may or may not benefit from such a garage flooring option. Yes, that is correct. After discussing how durable it can be, we don’t recommend polishing the concrete of your garage floor in most circumstances. Nevertheless, there are some people that are perfectly suited for such an option, as we will explain. The reasons vary and have to do with climate where you live, the maintenance required from exposing the surface to vehicle traffic, and the fact that polished concrete does not do as well in terms of chemical exposure such as solvents, gasoline, and acids. Let’s explain. We will start with climate first. If you live in an area of the country where it snows, your vehicle will be tracking in road salts and deicing fluids that collect on your garage floor. Polished concrete does not stand up well to a salty brine and will actually begin to lose its gloss. Road salts can even slightly etch the finish if left to linger long enough. Of course you can help to combat this with a winter containment mat if you like, but it will require diligence on your part to make sure that all winter liquids stay within the mat. The next reason has to do with routine floor maintenance from vehicle traffic. Most polished concrete is exposed to foot traffic only, though there are exceptions. Light industrial applications where fork lifts are used primarily indoors is an example. Vehicles, on the other hand, track in much more dirt and debris from the roads. This includes small pebbles and sandy grit. If the floor is not swept or dust mopped on a regular basis, your vehicle tires can actually degloss the finish over a long period of time in the areas where they consistently roll in and out of the garage. Essentially, what the tires are doing is slowly grinding the finish of the concrete with a more aggressive grit than what the floor was polished with. Granted, this grit is not diamonds so it does take some time. You can combat this fairly easily by simply keeping the floor clean. Maintaining polished concrete is simple due to the fact that it doesn’t take much to clean it. A dust mop is generally all that is required. Heavier cleaning can be done with the occasional wet mop using clean water only. But what about the concrete I see in home improvement centers? They always look good and have high traffic. Still, if you have a semi busy garage, this cleaning maintenance needs to be done on a fairly consistent basis — much more than what you would expect to do with a typical garage floor coating, mats, or garage floor tile. Yes, you may see some vehicle showrooms and automotive centers with polished concrete. What you don’t see is the routine mopping of the floors that are done every night. “But what about the concrete I see in home improvement centers? They always look good and have high traffic.” – Yes, they do. And most of that traffic is foot traffic. What you don’t see on most occasions are the routine maintenance and auto scrubbers that they ride around on to keep the floor looking that way. Lastly, polished concrete does not stand up as well to certain automotive fluids and can stain. Once polished concrete is stained, it is extremely difficult to remove the stain. Remember, polished concrete has open pores, though very small. Thicker viscous fluids such as oil do fairly well against staining. However, anti-freeze coolant, brake fluid, and solvents such as gasoline do not do well on polished concrete if not cleaned up quickly. Acidic based fluids can etch the surface as well. That is why a pH neutral cleaner should always be used if you need something stronger than just water to clean the surface. Stain guards can be applied to polished concrete to help resist staining. These are sealers that penetrate the concrete and leave an ultra-thin coating at the surface. They will break down if exposed to solvents or other strong chemicals for very long. However, they will buy you time to clean up and they will protect the concrete from staining in many circumstances since they act as a sacrificial layer. Stain guards will lose their luster if not maintained and may need to be reapplied or burnished with a floor buffer from time to time to keep the nice finish. Lastly, polished concrete is expensive. Expect to pay $6 to $10 per square foot and up depending on the level of shine you want, the shape of your concrete, and the size of your garage floor. It can get more expensive if you want to stain the concrete as well. Pricing per square foot typically increases for smaller jobs due to the time and effort required for transporting and setting up of the polishing equipment. 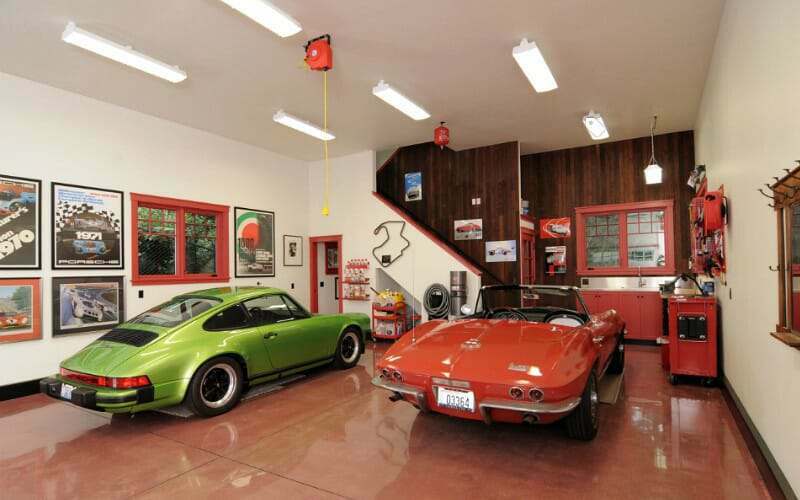 Conversely, there are situations where polished concrete can make for an excellent garage flooring option. For example, if you live in a milder climate and don’t do much maintenance on your vehicles other than parking them in your garage, then polished concrete can do quite well as long as you keep the floor routinely clean. If you do a search for polished concrete garage floors, the examples you will find are typically showroom style garages with classic cars or nice garages that look cleaner and more orderly than the inside of most homes. 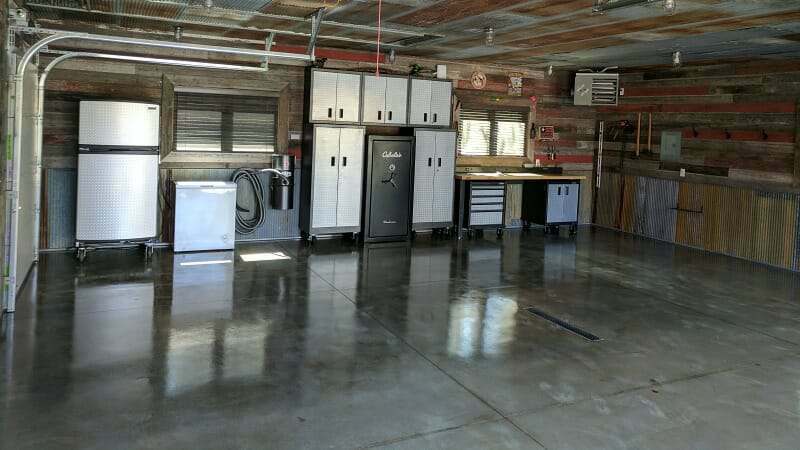 If you are the type of person who likes to maintain a clean garage and enjoys the routines of doing so, then polished concrete can give you years and years of service without issue. Yes, there are alternatives that can look very nice. Many of these do not require the constant cleaning maintenance as well. If you have hard troweled or power troweled concrete that is very smooth to begin with, there is an inexpensive option that can obtain a look that is somewhat similar to that of polished concrete. It involves the use of a stain guard that is burnished into the concrete surface with a high speed buffer. The picture above is a good example. You can learn more about stain guards and burnishing here. Another alternative is to apply a high gloss clear coating to your bare concrete such as epoxy or polyurea. It will not produce the same raw look of exposed aggregate, but it will provide a very nice, glossy finish. If you grind the concrete instead of acid etching in preparation for such a clear coating, it will create a more consistent look in terms of coloring and texture. A single-part polyurea is an excellent choice for bare concrete and it stands up extremely well in an automotive environment. Then there are the MMA acrylic sealers like the floor above. MMA acrylic sealers are not as durable as their epoxy or polyurea counterparts, but they are less expensive and will do well if you use your garage mostly to park your cars and don’t use it for extensive projects and other busy work. MMA acrylics are easy to apply and all you need in most cases is clean concrete that has not been previously sealed. As you can see, there are many things you need to consider before you decide to polish the concrete of your garage floor. While it can look absolutely stunning, it has its drawbacks if used in a garage environment. We are aware that some concrete polishing companies and contractors may disagree with our assessments, but we feel it’s important to point out the realities of polished concrete for a garage floor in order for you to be more informed before making a decision. It’s an expensive investment and you need to feel confident with your choice. If you are undecided about polishing your garage floor, we highly recommend contacting a few concrete polishing contractors to get a free estimate. Talk with them about your concerns and ask a lot of questions. They just may have the additional information that you require in your decision to have it done or not. 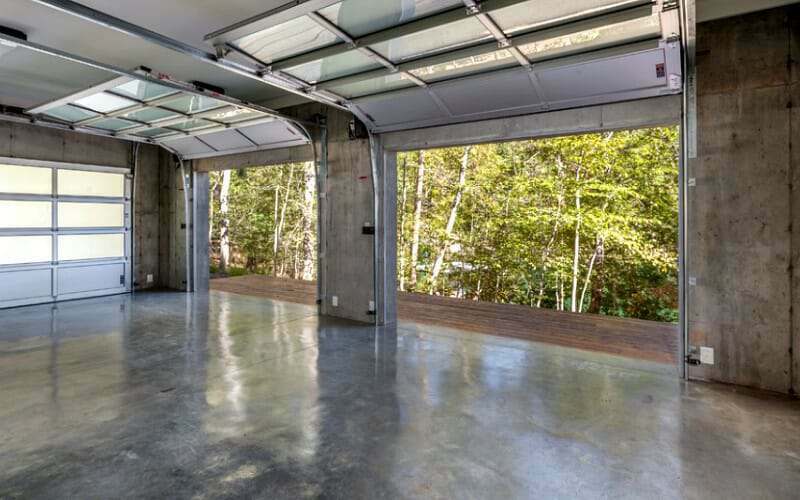 Regardless, a polished concrete garage floor can be a beautiful investment for your home. If you like the look, but the expense or realities of having such a floor are not feasible, then we recommend evaluating some of the other choices that we outlined above. Can I use a two part epoxy coating sold as pool coating on my garage floor? The color is a pale blue, can I darken the tint? Are you sure it’s an epoxy, Ron? Epoxy will yellow quickly if exposed to direct sunlight and is uncommon to use outdoors. Regardless, we wouldn’t recommend it. Epoxies are formulated differently for the environment and purpose for which they will be used. Pool epoxy is not going to have the same wear resistance and chemical resistance to automotive fluids since it is not designed to be driven on. You would be much better off purchasing the appropriate product.